In 1953, Wisconsin added occupational hearing loss to the list of claimable conditions under workers compensation. Employers Mutual of Wausau quickly created a program that would make the company an industry leader in hearing loss prevention. Creating a hearing loss prevention program not only reduced future costs from hearing damage claims, it also presented the company with the opportunity to be “the first” in a new field of workers compensation insurance. In fact, Employers Mutual salesmen were often encouraged to use the company’s pioneering entry into hearing loss claims as marketing. Conduct noise level surveys to determine if—and where—extreme noise might injure worker hearing. Find ways of controlling excessive noise. Employers Mutual understood that reducing hearing loss required new and different tactics. They could use bulletins and newsletters to ask workers to notice safety problems like worn out tools or uncovered machinery, but they could not expect workers to recognize dangerous noise levels. Hearing damage came from long exposure to noise that might fail to register as too loud. Since the average human couldn’t determine dangerous noise levels through hearing alone, Employers Mutual sent safety experts into noisy workplaces armed with specially designed audio-detection equipment to find it for them. Pages from Employers Mutual’s popular 1954 “Guide for Industrial Audiometric Technicians.” The guide taught the basics of audiology. Scan courtesy of the Marathon County Historical Society. The first two elements of Employers Mutual’s hearing loss prevention program were thus accomplished the company’s field staff and engineers. These experts were dispatched to test noise levels in policyholder workplaces, and to offer suggestions on how to reduce noise exposure. The final part of the hearing loss prevention program—to screen new employees for sensitive or damaged hearing before putting them to work—then fell to Employers Mutual’s consulting nurses. Since 1928, Employers Mutual had been sending nurses to their policyholders to provide medical expertise. In those days these “industrial nurses” advised on treating injured employees, provided training in basic first aid and industrial hygiene, and administered pre-employment checkups to make sure the health of new workers would not become a liability later. But by the 1950s, the role of the industrial nurse was shifting to find more technical and specialized ways of improving safety and health at work. Part of that shift included testing hearing of new employees using audiometers. By testing the hearing of new employees before they started working in a noisy factory, Employers Mutual’s Occupational Health Nurses (as industrial nurses were renamed in 1954) could determine if extra sensitive hearing or existing hearing damage would put the new worker at risk of hearing loss. This let the employer avoid filling a position with an employee who was more likely to be hurt. A Maico audiometer used by Employers Mutual of Wausau, WI, to test for hearing loss at workplaces in the mid-to-late 1960s. Photograph courtesy of the Marathon County Historical Society. The Marathon County Historical Society audiometer was used by one of Employers Mutual’s Occupational Health Consultants named Helen Onyett, from the Indianapolis branch office. Before she was hired by Employers Mutual in 1965, Onyett had served for over twenty years in the U.S. Army’s nursing corps and the reserves (she also holds the distinction of being the first Chinese-American woman to reach the rank of Colonel). At Employers Mutual, Helen rose to take on more responsibility and expertise by becoming a Senior Health Occupational Consultant before retiring in 1980. Helen Onyett, c. 1970. Onyett was an Occupational Health Consultant for Employers Mutual. Considering how common these hearing-testing tests are today, it might be easy to overlook how new the medical field is. After all, the word “audiology” was only coined in 1946! Audiometers were a new technology in the 1950s when Employers Mutual began to promote their use as preventative equipment. The first audiometers developed in the 1920s were large, temperamental, and needed extensive scientific experience to understand. But within a few decades audiometers were developed that were portable enough to take out of the lab and into the workplace, and training was developed to let people read and operate audiometers without having a doctorate in audiology. Employers Mutual of Wausau played a key role in making hearing a workplace safety concern embraced across the country. Employers Mutual Memos to “Sales General” from S.E. Staples, March 1955, attached to “Guide for Industrial Audiometric Technicians,” Marathon County Historical Society archives. 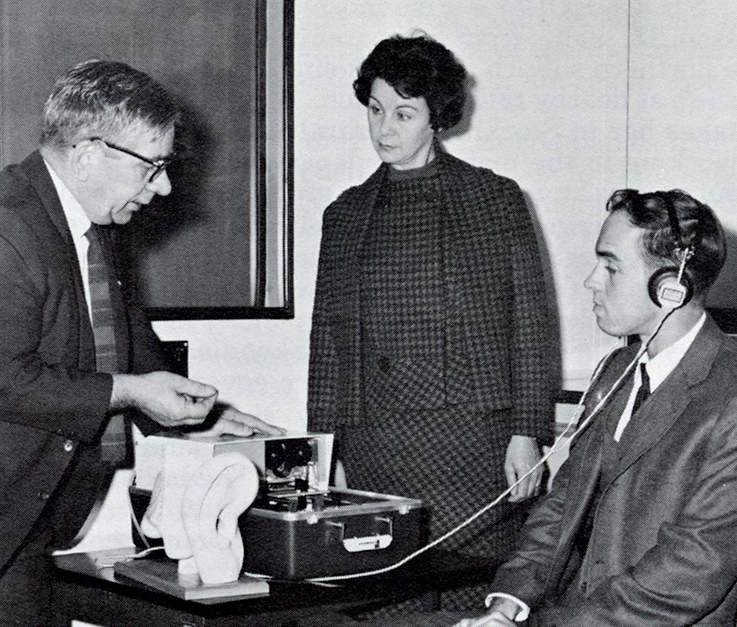 Featured image: Head of the Employers Mutual Hearing Loss Prevention program Dr. Roger Maas demonstrates an audiometer for Mrs. Drew, a visiting industrial nurse from England, 1967. Photograph courtesy of the Marathon County Historical Society.